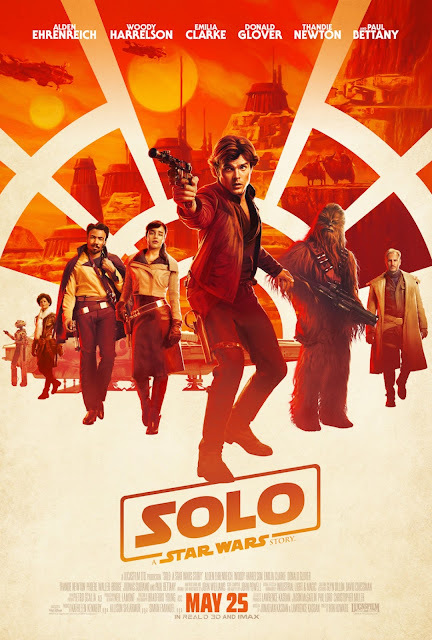 Pittsburgh Underground: Movies That Have Everything: Solo A Star Wars Story STARTS TOMORROW!!! Movies That Have Everything: Solo A Star Wars Story STARTS TOMORROW!!! If you would have told any Star Wars fan back in 1977 that 41 years later that Ron ‘Opie’ Howard would be directing a movie about the adventures of a young Han Solo, his first introduction to his best pal Chewie, and how he swindled the Millennium Falcon from previous owner, Lando Calrissian, you would have been greeted with more disbelief than when you’re ‘friends’ spilled the beans about Vadar being the daddy of our favorite Jedi as revealed in The Empire Strikes back three years later. Well, fast forward to 2018 as Solo: A Star Wars Story premieres on the silver screen in all it’s glory. Check out the trailer below! Taking on the role of a younger, less cynical Han (he has a good feeling about this) is Alden Ehrenreich as our favorite galactic scoundrel in his first adventure with his future first mate, the mighty Chewbacca (Joonas Suotamo taking over for the original (and very missed) Chewie, Peter Mayhew. Along the way, they’ll meet the notorious gambler, Lando Calrissian (Donald Glover) along with all new characters Qir’ra (Emilia Clarke), L3-37 (Phoebe Waller-Bridge), Val (Thandie Newton), and Beckett (Woody Harrelson) - mentor to the fledgling smuggler. Star Wars alum will also make cameos, but in different roles this time around including Anthony Daniels playing Tak, but more famously known for his portrayal of our favorite protocol droid, C3PO. Warwick Davis is also back as Weazel, but appeared in everything from Star Wars Rebels, The Last Jedi, Rogue One, The Force Awakens, The Phantom Menace, and most notably as Wicket the Ewok in Return of the Jedi. Also keep your eyes peeled for Ron Howard’s brother, character actor Clint Howard to make an appearance as a new character named Ralakili. The gang from good ol’ PU is very excited to see another Star Wars story play out, but centering around one of our favorite characters is only an added bonus (we miss you Han!). Solo: A Star Wars Story starts this Friday at your local theater.